The Messerschmitt Me 410 has not received as much attention as many other Luftwaffe aircraft. Fortunately, Mushroom Model Magazine never shies away from a subject solely on the grounds of relative obscurity. I was pleased to see that the latest release in Mushroom's Yellow series is a useful and detailed reference on this flawed yet interesting aircraft. The author, Robert Peczkowski, adopts a logical approach to the subject. The text starts with a description of the origins of the 410 from the ashes of the unambiguously disastrous Me 210. The Me 210 suffered from fatal instability and a tendency to spin at the slightest provocation. 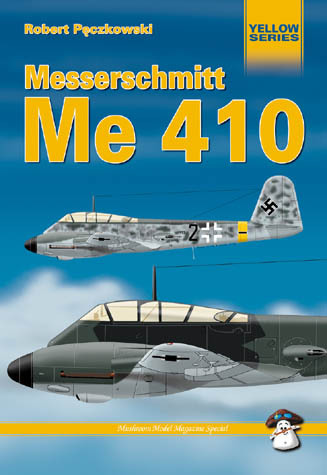 The measures taken to address these faults, eventually leading to the Messerschmitt Me 410, are covered effectively in this chapter. These alterations were largely successful in that the Me 410 was no longer more dangerous to the aircraft than enemy pilots; but it was still generally unsuited to any role for which it was designed. Following this introduction we are provided with a list of variants and their characteristics, a technical description and three pages of tables detailing production and specifications.. The bulk of the book, from pages 41 to 104, offers colour walk around photos, including access to some of the most out of the way areas imaginable. This section is also peppered with technical drawings. The book is rounded out with 28 colour profiles of various Me 410s, plus one plan view representing the mainstream colours and some of the most interesting Luftwaffe (and in two cases RAF) markings. The quality of the artwork is very good, although I am not entirely convinced about the RLM 70/71 scheme proposed in one of the profiles. Mushroom's "Messerschmitt Me 410" will be interesting to all Luftwaffe enthusiasts, but will be especially helpful to modellers due to the ample detailed reference photos and line drawings, plus the inspiration of the attractive artwork.